A brief guide to the understanding and using of electricity systems in stage lighting, we start by looking at the basics of how electricity arrives at the stage and common equipment used in stage electrics. Reader curiosity about power equipment and it’s uses has sparked (?!) this article. We won’t go through all the ins and outs of electrical theory but instead give you an overview of the systems involved and how to recognise certain elements. Disclaimer: This article is intended to provide some insight into the working of a professional stage electrical system for the beginner. It does not provide comprehensive training in electrics or safety and should not be viewed as such. The design of a stage lighting electrical system should be entrusted to an experienced and competent person. No warranty is implied concerning the accuracy of any information contained therein. On Stage Lighting can accept no responsibility for any inaccuracy of information or for any loss, damage or injury arising from any interpretation of its contents. While many departments use power, the overall design and distribution of a safe and bombproof electrical supply still often falls into the hands of the LX crew. Temporary power distribution equipment for events is commonly of the “plug and play” variety which doesn’t require a degree in electrical engineering to connect a system together but it does a good understanding of electrical theory and safety. It’s important to understand a little about how power arrives for us to use on stage, without going into all the details about substations, transformers and power stations. Distribution Boards – Supplies from the main incomer are sent to a number of dist boards situated around a building depending on the electrical needs of each area. Each board has a set of switches that do different things and recognising them is important, particularly if you have a supply outage “upstream” from your kit. We’ll go into that in detail further on. It’s also good to understand that some distribution boards, particularly smaller ones, can be fed from another distro panel – worth knowing in the case of a supply interruption. When you’re new to stage lighting, 3 phase electricity is perceived as both mystical and dangerous – something scary and hugely difficult to comprehend. Let’s just clear this up – ALL ELECTRICITY CAN BE DANGEROUS. It can kill you, 3 phase or single phase. Is 3 phase electricity more dangerous? We use all three phases in stage lighting systems because it brings more power into one place. The use of a large 3 phase cable is where confusion sets in but it’s just three supplies – 3 x Line/Live conductors and 1 x Neutral (shared between the supplies) plus an Earth. 3 Phase plugs usually have 5 pins, one for each conductor (actually, some 3 phase plugs have only 4 pins but we don’t need to worry about that right now). A major part of safe electrical systems design is what we call protection, things that stop people getting hurt by electricity and the fallout when something goes wrong. People protection – The parts of an electrical system that protect people from electric shocks cut the supply at the first sign of trouble. 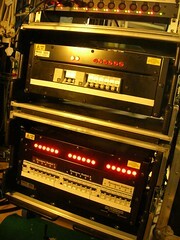 In the UK, Residual Current Devices (RCDs,) are built into different parts of the distro system particularly at the “user” end such as on stage supplies to backline equipment. An ideal show supply would have individual RCDs protecting small power socket outlets, moving lights, consoles etc meaning that any interruption does not remove the entire supply. RCD’s are called GFIs in the US. Kit protection – Fuses or MCBs (Miniature Circuit Breakers) provide overload protecton – cutting the supply if any equipment draws more power than the supply was designer for. Overload on a circuit is a good way of detecting some kind of fault and ditching the supply prevents fires and excess damage to kit. Fuses or MCBs don’t save people. Isolators – A switch that simply isolates the power. Maybe a big, single red switch on a dist board or a separate box with a toilet flush handle, the isolator is used to shut off power to a panel when performing maintenance on the installed system. The isolator is not like an MCB or RCD, it doesn’t go off of it’s own freewill. MCB’s – MCB’s usually make up the majority of switches on a board and provide an isolator to the circuit as well as overload protection. Usually marked up with their type letter and their maximum power rating in Amps such as C16 – a C type rated at 16 Amps. 3 Phase MCB’s look like a line of 3 switches with their handles joined together and are again marked with their type and rating. Incoming Supply – From the venue, a facility panel with one or more sockets. These sockets might have their own isolator switches, RCD’s or overload protection near them but they could also be upstream and the dist board supplying the outlet. It’s good to find out where this is before you need it. Main Distro Box – Often receives a large 3 phase supply and splits it down into smaller outlets either 3 or 1 Phase. Each outlet has it’s own MCB protection and the whole box may have some form of RCD. The RCD on a Main Distro box might have a key switch to disable it – this is for situations where you have adequate RCD protection downstream of the box and wish to eliminate the chance of a whole supply outage. The switch isn’t to be used just coz you have earth problems with the kit and the supply keeps popping out. Individual Feeds – Dimmer outlets, cables to moving lights, sockets for the band etc. This is where the user meets the juice. 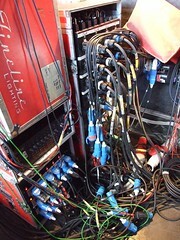 A stage electrics system is just like any other power distribution. It starts with a very large supply and cascades it down through various types of protection until it arrives where it is needed via a much smaller socket. Using specifically designed distro kit with competence, creating a safe and reliable power system doesn’t have to be hard. Getting a rock solid incomer in certain parts of the world can be tough and getting a decent earth in the desert even harder – but that’s another story. Electricity should be taken seriously. Stay safe. I would like to learn more on disrtos. Nice article, Question …are there many jobs in this area of stage work? @ Jimmy – Larger shows + specials like outdoor events have power requirements that need a dedicated team to look after them. There is a decent amount of work in this area – quite a lot of lampies also work as main engineers. I did this on the G20 Summit at Excel, just mains – the lighting department being a different crew. You can imagine how important the electric supply is on a large site like that. So is it a full blow electronic engineer qualifications job? While systems design and wiring require a level of competence/qualification, most of the components are plug and play. Lampies have more experience of these temporary supplies than standard electricians so are ideal to crew the mains department. The right bits of paper usually belong to those who oversee the work and the test/inspect guys (who usually know more about earth loop impedance that what the rigger want from a supply). Nice article Rob.Thanx for the help. All electricity is safe as long as it’s used correctly, i’ve had more than one shock from a domestic 13A ring main and yes, it’s painful – and can be lethal. Great article, i used it to do my SACE research project. Nice article. Thanks Rob. I would have liked it to read on in a little more detail though. I have had a little shock from a dimmer channel at 0 before in full knowledge that “0” does not mean “off”. I was up a ladder struggling to unplug a lantern where the socket on the extension was particularly tight and I eventually gave in and used my Leatherman to pries the plug out. I hadn’t plugged the other end in yet, but I didn’t check with my colleagues and one of them had patched it in for me. I received a nice little jolt as a reward. I got off lightly with a mild shock and I’ve never been so careless since. nice piece of article…with fun sprinkled on it…. Rob. I realise this not quite your field but it is close! What curve trips would you advise to use on a stage power distribution for a sound system and musicians? I’m coming back into this after quite a long break and I cannot remember what we used to use, I probably didn’t take much notice as most the kit I have used over the last 40 yrs belonged to the companies I worked for and trips rarely gave problems. BS 7909 is the place to look, along with 7671. A number of 13A out stage boxes I’ve come across are a 32A incomer and wired as a ring main. The main area where power is required is the amps and the desk end. As the amps are in racks behind each speaker stack I am going to send a 32 amp cable across the stage to provide power for the remote rack. (I would like to send it across the front but I suspect due to H&S I should be ready to send it round the back of the stage in some venues). The desk and outboard racks could plug in where they are sited in the auditorium if there are sockets available as all lines to stage are balanced and isolated so phase and earth variations should not be a problem. I will have a long 32 amp cable though so the desk etc can all star wire back to the stage distribution point. As I say in a lot of instances I will be happy to just put 13 amp tails on a couple of stage box extensions for the back-line equipment and keep the musicians off my system distribution system. That way they are the venues responsibility! Just to clarify, the ring wiring I mean is an enclosed box with 32A in, breaker etc. and 6 – 8 13A outlets wired internally as ring circuit. The boxes are installed radially when it comes to on stage cabling. The result is like a room ring-main-in-a-box. To be honest, if you want to put together some really robust and compliant distro, I’d talk to Rubber Box Co or similar. Their stuff isn’t particularly cheap but the result is bombproof, long lasting and easily defensible in case of incident. Then it’s plug and play.